As a facilitator I frequently design and run interactive sessions for groups ranging from one or two people up to a few hundred. Facilitation is a skill that can be utilized in a variety of contexts including Visioning and Strategic Planning, Project Planning, Needs Analysis and Discovery, Conflict Resolution and Crisis Response to name just a few scenarios. 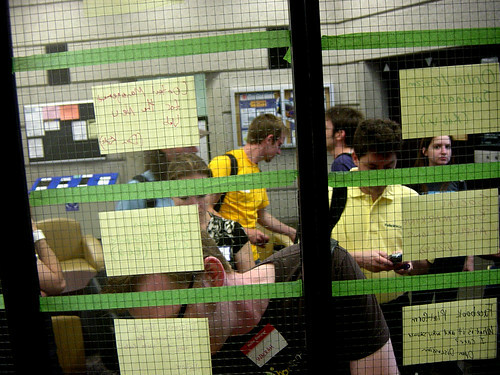 Well, BarCampTTW has come and gone. As the unofficial kickoff to Toronto Tech Week, I’d have to say BarCampTTW was a rousing success. Based on the show of hands we had a pretty diverse crowd where almost 50% of the participants were first time BarCampers. Also a good sign was the number of women we had come out – while numbers are still in the teens they represented about a quarter of the attendees. In recent month’s there’s been lots of discussion in both the conference and unconference spaces around the lack of female representation so it’s good to see that some improvement is being made but we’ve still got a ways to go. All in all the sessions were quite interesting and I found this camp definitely slanted more to the conceptual and ideas rather than pure tech which was interesting. I was talking with some folks at the post-camp drinks and realized that I’ve started to look at BarCamp as the generalist platform/entry point into the community that we use to launch niche interest groups/events from (DemoCamp, VizThink, InteractionCamp, TransitCamp, EnterpriseCamp etc.) . It truly has no agenda or theme out of the gate and, true to form, is entirely whatever the participants make of it. It’ll be interesting to see how the nature of the event changes as we continue to reach out and try and bring new members into the community. Photos from the event can be found here. Blog posts from the event can be found here & here. It’s through supporters like the organizations above that we’re able to put on these great events and keep the price of admittance your time and a willingness to participate. Check out the TorCamp page to see what events are coming up (VizThink3 is June 14th). If you’re not from Toronto, the BarCamp community is a truly global phenomenon – check out the BarCamp site to see what is going on in your neck of the woods (or see how to start something up).